The report titled “UAE Lubricants Market Outlook to 2022 – By Automotive (Heavy Duty Diesel Engine Oils, Passenger Car Motor Oils, Hydraulic Oils, Gear Oils, Greases and Transmission Fluids) and Industrial Lubricants (Hydraulic Oils, Industrial Gear Oils, Greases, Compressor Oils, Turbine Oils and Transformer Oils)”provides a comprehensive analysis of automotive and industrial lubricants market in UAE. The report focuses on overall market size, market segmentation by origin (mineral, synthetic and semi-synthetic lubricants), by application (automotive and industrial lubricants), market segmentation of automotive lubricants market by application (heavy duty diesel engine oils, passenger car motor oils, hydraulic oils, gear oils, greases, and transmission fluids), by end users (passenger vehicle lubricants, commercial vehicle lubricants, marine lubricants and aviation lubricants), by channel of distribution (OEM workshops/service stations, dealer network, supermarket and others), market segmentation of industrial lubricants market by application (hydraulic oils, industrial gear oils, turbine oils, compressor oils, greases and transformer oils), by end users (construction, power generation, manufacturing and others) and by channel of distribution (direct sales by companies and dealer network). The report also covers the overall competitive landscape; government role and regulations, trade scenario, snapshot on emerging lubricants, trends and developments. The report concludes with future projections highlighting the major opportunities and cautions. UAE lubricant market is at mature stage. Domestic and international players have catered to the demand of lubricants that led to increase in market revenue. Synthetic lubricants which have witnessed an increase in demand as they provide better protection to engine and machinery and augment engine performance in varying conditions. The growth in exports till the year 2015 was largely attributed to increase in demand for lubricants from importing countries accompanied by rise in crude oil prices. However, post 2015, the market has considerably declined owing to effects of oil slump which led to decline in the prices of lubricants. Mineral Lubricants have been the most produced lubricants in the UAE during the year 2017 which is due to their lower retail price and easy process of refining as compared to other lubricant types. 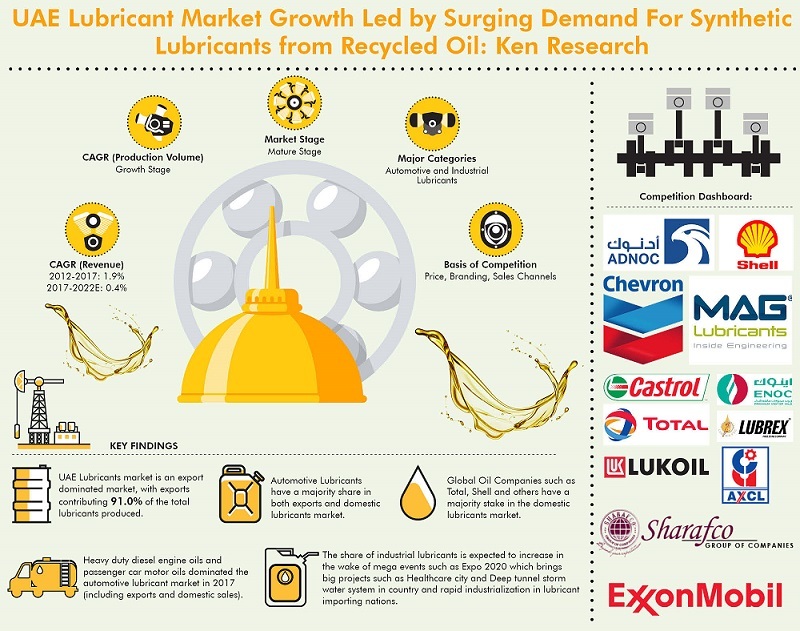 Synthetic and semi-synthetic lubricants have taken the remaining share of the market. Heavy duty diesel engine oils and passenger car motor oils dominated the market of automotive lubricants in 2017. Increase in sales of new cars and strong growth in pre-owned vehicles market of emerging economies has helped in augmenting sales of motor oils. Transmission fluids witnessed a low market share which is owed to the fact that these oils are replaced after vehicles travel a distance larger than 60,000 miles. Hydraulic oils, gear oils and greases have taken the remaining market share. Passenger vehicles and commercial vehicles were biggest consumers of lubricants in 2017 in UAE as these automobiles require oil change after certain specific distance. Marine lubricants have taken a considerable share in the market owing to increase in demand from rising number of ship fleet. OEM workshops and service stations sold major proportion of automotive lubricants in UAE in 2017. The major reason behind this is that people who visit a service station for refueling can avail other car services such as tyre change, car wash along with lube change. Collaboration of reputed OEM’s with dealers has augmented sales of automobile lubricants from dealer network while supermarkets, online websites and hyper markets sold lower volumes of automotive lubricants. Hydraulic oils dominated the industrial lubricants market as they are largely used in machineries based on hydraulic system. Greases and gear oils are next most used industrial lubricants since they help in lubrication of gear parts and dwellings and make them impervious to water. Turbine oils and compressor oils have taken the remaining share of industrial lubricant market. Construction industry consumed maximum amount of industrial lubricants which are required for lubrication of heavy machinery that is commonly used in this industry. Power generation sector which typically requires transformer oils and engine oils is the next biggest consumer of industrial lubricants and manufacturing sector accounted for smaller share of lubricant consumption in the country. ADNOC and Total are the biggest players in UAE domestic lubricant market who sold significant volume of lubricants in 2017. Shell and Caltex were the next biggest players in UAE domestic lubricant market. ADNOC has large presence in UAE and it can cater to a large captive audience while total has its own blending plant in UAE because of which it can supply large volume of lubricants in UAE. Numerous small players have taken a sizeable market share in 2017. The UAE Lubricants market is expected to grow positively from 2017 to 2022 in terms of production volume. Increase in service station network will strengthen the distribution channel in UAE so as to increase market share of key players such as ADNOC. Automotive lubricants will dominate the market and demand of synthetic lubricants will increase as these lubricants provide enhanced engine protection and augment car performance. The share of industrial lubricants is expected to increase in both domestic and export market of lubricants in the wake of mega events such as Expo 2020 which brings big projects such as Healthcare city and Deep tunnel storm water system in country and rapid industrialization in lubricant importing nations. Rulexx Lubricants and Grease Ind llc.